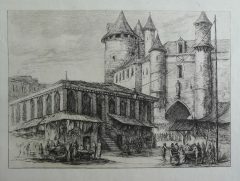 Charles Meryon:Original Signed Etchings-Free Shipping. Charles Meryon born in Paris and attended school at the Pension Savery in Passy. In 1837 he entered the Naval School at Brest .His early naval career took him around the world giving him a lot of opportunity to sketch. Having received a small inheritance, Meryon decided to become and artist. Based in Paris he began painting lessons, however he suffered from Daltonism, a form of colour blindness in which one colour is mistaken for another and by 1850 his career as a painter had already effectively ended. It was as a graphic artist, and especially as an original etcher, that Charles Meryon was to excel. He studied at the studio of E. Blery, the engraver, copying portraits and engravings, but it was one master in particular, Renier Zeeman, who was to seize his imagination and transform him into an etcher. 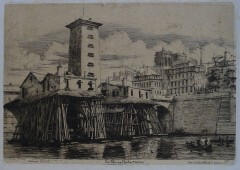 By 1849 he conceived the idea of a series of etchings devoted to the city he loved. 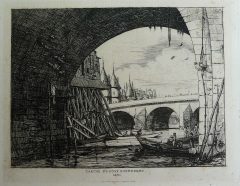 He dedicated these works to Zeeman, his mentor, and between the years 1851 and 1854 appeared the Eaux-fortes sur Paris, the series of works upon which the bulk of his fame now rests. The technical mastery of these brilliant works would be sufficient alone to establish Charles Meryon’s position amongst the greatest of all etchers. However,although his work was admired by his peers in France and in England, he lived in poverty. He was friends with the writers Victor Hugo, Baudelaire and his fellow artist Bracquemond. His disciples were Whistler, Haden and Legros, who were instrumental in reviving the craftsmanship of etching in Britain. In 1858 he was admitted to Charenton, a mental asylum, briefly, but he managed to get better and returned to work, having a show at the International Exhibition in London in 1862. He died in an asylum at the age of forty-seven. ‘Le Grand Châtelet á Paris, vers 1780’ by Charles Meryon.